The Journey for Justice Alliance (J4J) is a diverse, intergenerational network of 35 community-based organizations across 22 cities fighting for educational justice and equity for all children. Originally formed by parent organizers who realized they needed to unite together to make a serious impact, J4J is organizing to build Black- and Brown-led multiracial coalitions to win victories for equity at the local and national levels. 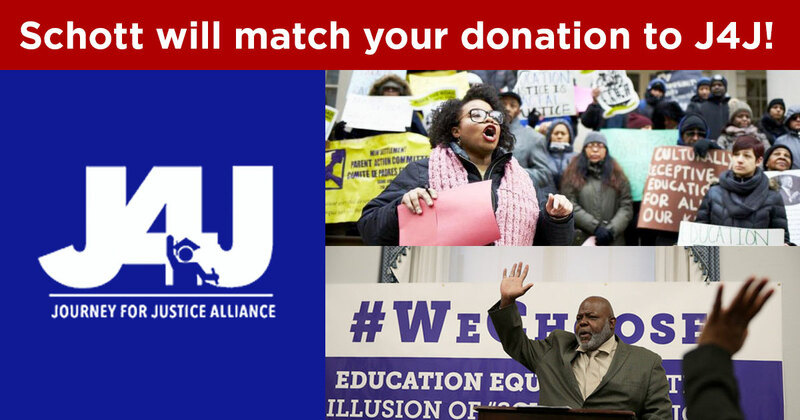 Throughout April, Schott is matching your donation to J4J — and doubling it! For every $10 you donate Schott will donate $20, up to $60,000 total! Your donation is tax-deductible. Save the donation confirmation email for your records. Copyright 2019 The Schott Foundation for Public Education, a 501(c)(3) organization. Contact Us.